Welcome to Day 1 of our January SavingsPinay Series. If you missed the introduction then you can click this LINK or the post yesterday. Financial Planning 101 is a great way to kick start the New Year right with your finances. You will be introduced to the importance knowing the what and ho of money. In the hope that the more you learn about money, the more you will be better in handling everything. 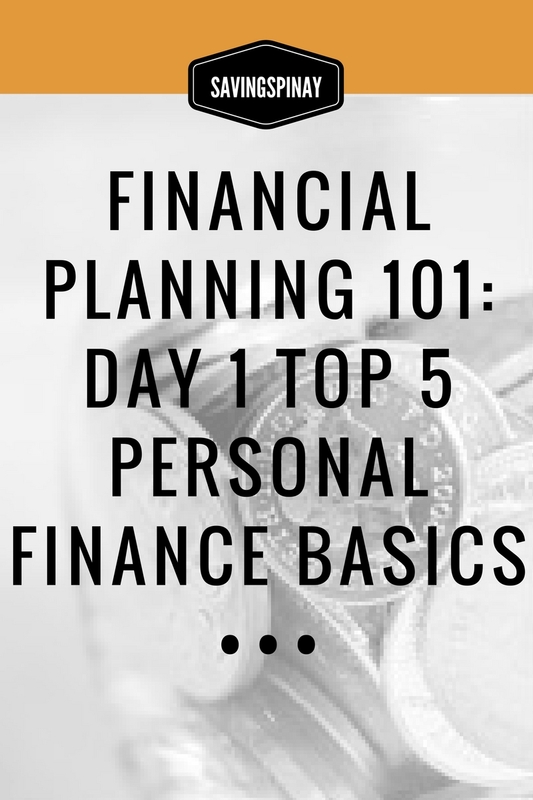 Day 1 is about the Top 5 Personal Finance Basics. But before we unravel the these five money topics that correlates with each other let’s first define some terms. Financial Planning on the other hand is a comprehensive evaluation of how an individual or business will afford to achieve one’s strategic goals and objectives. Why Personal Financial Planning is Important? Personal Financial Planning is such an important process that could help you achieve your financial goals. You are creating the very plan that will make your dream lifestyle happen. Personal Financial Planning will act as a blueprint to your financial life. It will be a guide you will carefully consider before taking any financial decision. No matter how small or big your goal is, as long as you properly plan and execute the steps, know that nothing is impossible. As said earlier, personal finance covers a wide variety of money topics. But today we will be focusing our mind on the core financial matters. These five defines the most important part of personal finance. A Budget is a powerful personal financial planning tool that is done/written daily, weekly, monthly or yearly where you allocate how much your spend and/or save. This will also keep track of your spending patters, record your income and assess whether you are spending more than you should be. Below are steps on how to create a budget. 1. Record Your Income. Take not of your salary or any other extra income. If you receive a regular paycheck make sure that you record how much your take home pay is. 2. Create a List of Your Expenses. 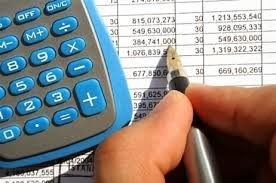 Your expenses will be your budget categories or simply the items where you will allocate the money with. READ: Budget Categories post. 3. Keep Track of Your Spending. If you want to commit on your budget then you should learn to keep track on where your money goes. This is part of a successful budget because you know exactly the movement of your hard earned cash. Visit My New Budget and Spending Tracker or create your own with my DIY Spending Tracker post. How to Make a Budget Work For You? It will be very hard to maintain a budget. I shared my personal struggle in How I Still Choose To Love Budgeting Even If It Doesn’t Love Me Back. I am not a perfect when it comes to my finances and I do have my fair share of short comings. But the one thing that help me make my budget work is setting my mind, heart and soul for it. You have to really commit to the habit. Never let yourself miss one day or one week or a month without a budget. Make it part of your financial routine. Reflect on areas where you spend more than you should. Then reward yourself if ever you successfully budgeted for the said month, week or day. Savings will determine how much you love yourself. It is exactly described as the pay yourself first policy. Before you spend your money on anything else, you need to give back to your personal fund first. Whether you are saving for your emergency fund, future fund or adventure fund, you need to have more than enough money saved. I have shared how to save money on last week’s Reader Question post but as a recap and summary below are the key steps you need to do if you want to save. Again all explanation will be present in the previous post. How Much Should You Save in a Month? You can either follow my 50-20-30 Rule of Budgeting where 20% of your income is automatically set to a saving fund or have your own assessment on how much you can save in a month. Start low but consistently then increase your savings as your income increases. READ : How to Save Within Your Salary. The key in saving money is treating it as a non-negotiable expense. Income – Savings = Expenses. Make saving the first bill you’ll pay. One’s spending method says a lot of the lifestyle he or she has been raised with. Proper spending also plays a big part in good financial planning. How to Correctly Spend Your Money? Always be mindful of how much income comes in your resources and learn to spend below its total amount. Do not try living a costly lifestyle that you can’t afford for you will only be the one to suffer in the end. A budget plays a big part in your spending routine. Everything that goes out of your cash flow must agree in the budget you set with it. Spend within the amount written in your budget. Buy things that sparks joy, that lasts longer. Intentional spending is being very aware of what you are purchasing. You know exactly what is it for and why you need it. God is the ultimate source of wealth. He is the sole reason for every blessing that comes in your financial life. Tithe no matter what. Spend your talent, your time, your efforts for His glory. An investment is an asset or item purchased with the hope that it will generate income in the future. Investing on the other hand is the act of committing money or capital to a a business, project, real estate or other vehicles with the expectation of obtaining profit. Investing takes risks and has no guarantees. It is important that one must research and learn more before finally deciding on something. There are many investment vehicle that one can choose from to grow their money. The most common investment vehicles are those with your bank like savings account and time deposit. Other option includes mutual fund, direct stock investing and real estate investments. Assess what investment vehicle match your investment goals and the type of investor you are. Make time your best ally. Invest early and invest long. You will never see the full potential of your money if you don’t let it grow. Treat your investment as a non-negotiable one just like saving money. Save and Invest rather than Save to Spend. Retirement plays a crucial part in one’s personal finance. Thus, it deserves its own series sometime in the future. What’s important to take note here is that you need to be able to enjoy your retirement. It is something you have to plan early. How you budget, save, spend and invest your money today will determine what kind or retirement you will live in the future. A flawless personal finance planning will enable you to enjoy your retirement even better. I hope you enjoyed Day 1 of our January SavingsPinay Series. See you tomorrow for Day 2.